PDC, the global leader of innovative identification solutions, announced the installation of its Smart Band RFID wristband system at Great Wolf Lodge New England in Fitchburg, MA for electronic access control and cashless payments. The indoor waterpark is the latest of eight Great Wolf Lodge resorts to introduce PDC’s RFID wristband technology to enhance the guest experience. Designed for the specific needs of waterpark and resort guests, Smart Ban replaces traditional forms of identification, payment, and access credentials that are usually carried in a wallet, purse, or pocket. Upon check in, Great Wolf Lodge guests are issued a non-transferable, waterproof PDC Smart Band, with a securely sealed RFID chip inside that verifies guest data when scanned by a reader. Each chip contains a unique ID number so the bands are impossible to duplicate. Functioning as a convenient “wrist wallet,” Smart Band enables Great Wolf Lodge guests to make instant purchases using their RFID wristband. “The cashless transactions take about half the time compared to using credit cards or cash, increasing impulse purchasing. Even the vending machines accept cashless payments, so guests don’t have to dig for change, and are more inclined to make some smaller purchases they might normally pass on,” said Robin Barber, vice president of leisure and entertainment for PDC. For hotel room access, Smart Band’s contactless interface provides significant advantages over standard magnetic stripe key cards, which can collect dirt and debris that impact performance. As Smart Band is safely fastened around the wrist, it provides a more secure advantage. “PDC’s Smart Band RFID Wristband System has helped us provide convenience and efficiencies to our guests that truly distinguish our resorts as innovators in the travel and destination industry,” Castellino continued. Smart Band can be completely customised and is offered in a wide variety of colours and material options including plastic, silicone and woven fabric. Smart Band is available with nontransferable SecurSnap closures, and in re-wearable styles for single-day use or for a season pass program. 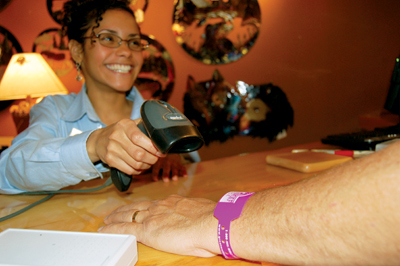 In addition to its New England resort, Great Wolf Resorts uses PDC’s Smart Band RFID Wristband System at locations in: Poconos, PA; Niagara Falls, ONT, Mason, OH; Grapevine, TX; Grand Mound, WA; Williamsburg, VA; and Concord, NC. With more than 55 years of experience, PDC is the global leader and pacesetter in the development of wristbands, lanyards and RFID solutions. The company serves the leisure and entertainment, law enforcement, and animal identification industries. A pioneer of innovative technologies, PDC introduced the first bar code wristband system, first thermal printer wristband, first Smart Band RFID wristband system, and the award-winning PDC Smart Kiosk, among many other innovations.